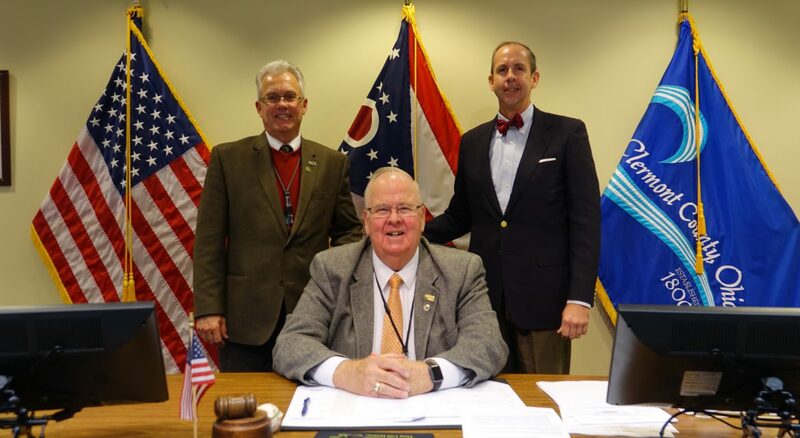 As Clermont County Commissioners, we are very concerned about the continued decline of funding from the State of Ohio to counties. This has been going on for several years, and has had a severe impact on our ability to provide services both mandated and needed by our residents. We fully support the County Commissioners Association of Ohio’s “Stronger Counties. Stronger Partnership. Stronger Ohio” initiative, which has proposed a number of measures to address the concerns of counties throughout our state. On Sept. 20, 2018, we passed a resolution voicing that support. Restore the $166 million annual Medicaid Managed Care Organization revenue loss to counties. The federal government forced Ohio to eliminate this tax in 2017. The state has replaced it with a Medicaid fee structure that provides no benefit to counties. Counties should also be made whole. Restore the Local Government Fund to its previous statutory level of 3.68 percent of the General Revenue Fund (GRF) taxes, creating an additional $145 million annually for counties. Currently the LGF receives 1.66 percent of GRF taxes, as compared to 3.68 percent in 2008. We want to note that in Clermont County, over half of this revenue is distributed each year to cities, villages and townships within the county, so they are hurting too by the decrease in this revenue source. Villages and cities must depend on local income taxes to try to make up for this shortfall. Establish and fund a special state line item that would pay for a portion of the increased costs related to the explosive growth of the opiate epidemic crisis. Assume total responsibility for indigent defense. In Gideon v. Wainwright (1963), the U.S. Supreme Court held that the fundamental right to counsel is made obligatory upon the states by the fourteenth amendment. The state should accept this responsibility and stop requiring its counties to bear 50 percent or more of the costs. The Ohio Public Defender’s Office estimates that in fiscal year 2018, indigent defense services will cost counties $79.5 million. As reliable revenue sources have declined for the county, our obligations have only grown. The opioid crisis alone costs counties tens of millions of dollars a year. In Clermont County, we’ve seen a huge increase in costs for law enforcement, courts, jail, mental health and treatment, not to mention the impact on children and families, all stemming from the opioid crisis. Counties are bearing a disproportionate share of these costs. CCAO recently met with Mike DeWine and Richard Cordray, both running for the office of governor, to detail the concerns of Ohio counties and brief the candidates on measures that could put the partnership between the state and counties on a stronger footing. The next governor and Legislature must address these concerns and take steps to address these budgetary issues. We value our partnership with the State of Ohio, and we know it can become a fairer one. CCAO: Stronger Counties. Stronger Partnership. Stronger Ohio.